The best power wheels are the cornerstone of any great childhood. Kids love nothing more than jumping in these tiny vehicles and going for a ride. Kids’ ride-on toys have advanced tremendously over the years and today come equipped with all the features of real vehicles including lights, radio, sound effects and more. All parents enjoy watching their kids take the wheel for the first time; it’s certainly fun for all involved. So if you want to find the best power wheels for your little one check out our reviews of some of the best offerings below. The great thing about ride-on toys such as the best power wheels is that they are the ideal kids’ gift. It can be extremely challenging to select a gift, especially when you know they probably have lots of entertaining gadgets in their arsenal. This is why the best power wheels are a good option, they have the wow factor and offer a unique driving experience unique to them alone, providing that fun-filled experience kids love and what parents strive for. This neat little car is just like the genuine thing and to any kid, it is bound to provide an authentic driving experience that they are bound to enjoy. The Jeep Wrangler is moderately fast for a power wheel and can achieve speeds of up to 5 mph whilst accelerating and 2.5 mph when reversing. It is powered by a 12V battery and alerts you when it is running low, which is a bonus compared to many models that provide no warning and stop all of a sudden. The wrangler is made with hard surfaces in mind, such as stone paths and dry grasslands, which is something to bear in mind, especially when many individuals might get it assuming it is designed for off-road driving. Regardless, this jeep design comes with all the features of a normal life-sized jeep including large wheels, fenders, and floodlights for an authentic jeep feel. In addition, there is a storage compartment ideal for holding snacks and toys. The maximum weight this model can hold is 130 lbs, however, bear in mind that this doesn’t mean adults can attempt to take a free ride courtesy of their child, it’s neither safe or a good idea. However, this jeep wrangler still provides the perfect learning experience with cruise control, hand-eye coordination and planning all being developed when playing with this toy. This toy jeep is designed for kids aged 2 to 6 years of age and is ideal for a 30 minute drive time of up to around 1.5 miles. The speed setting on low is slow enough to be caught up to with a few strides and the higher setting a slightly faster pace. The shipping on this model is typically quite fast, well protected with all the necessary parts. Assembly can take around an hour and the majority of people say that it’s very easy and takes much less time than an hour. This luxurious looking AMG Mercedes may look like it can reach dangerous speeds, but thankfully with a maximum speed of 4mph, it is incredibly safe for your kids to use. As well as a forward drive the Mercedes AMG offers a reverse function and is a great toy to help young children develop coordination and confidence. This little Mercedes is very easy to drive and your kid will find it very easy to press their foot down on the pedal with no issues. Interestingly, this car can be controlled by parents if required as it comes equipped with a remote control, especially for parents. This provides you with peace of mind while they build experience and confidence. The best part of this power wheel car, in particular, is the stunning design by Mercedes which features everything from chrome detailing, leather cushions and a high-quality finish. 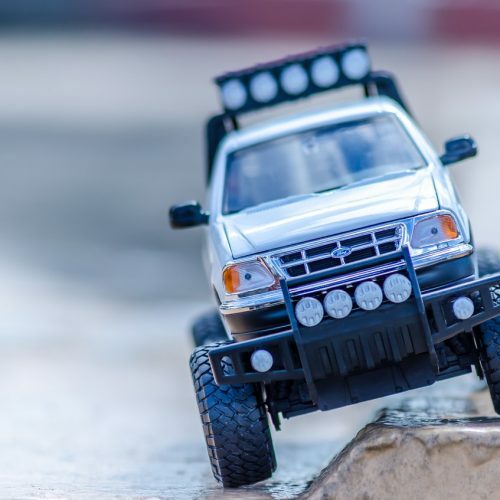 This model certainly stands out among the many rivals available and although it is pricier than many other toy cars out there, it is worth the investment for an extra special experience. In addition to the structural details, the car also comes fitted with a trunk handy for transporting snacks and toys as well as car mats and working radio. Perhaps the best part of this vehicle is the ability to play music and the array of sound effects that it comes with. This model is suitable for the age range of 1-5 years but is probably best suited to toddlers above 2 years of age. This model is probably one of the best on the market and offers a complete life-like driving experience by a premium car brand. This Frozen themed Jeep by Disney will make many fans of the film happy and is the perfect excuse to send them outside for a cruise and sing the famous frozen song. This Jeep is pink and themed with stickers of characters from the hit movie making it an ideal gift for little girls. This ride-on car for girls is constructed of a solid structure and is able to take up to 130 lbs and accommodate 2 kids riding in it. This pink kids jeep has multiple speed settings including a 2.5 mph setting, which is ideal for younger kids just learning how to drive. It also includes a maximum speed of 5 Mph which is best suited for older kids or once they’ve built up some confidence riding around in the mini Jeep Wrangler. Ultimately, power wheel cars make an amazing gift and act as an awesome learning tool, allowing kids to build confidence, explore their surroundings and pursue their own little adventures with friends. This ride-on tractor is the perfect gift for kids and parents that love farming, outdoor fun and digging around in the sand and mud. Best of all is that this power wheels tractor is made in the USA in Indiana. This power wheel is ideal for age ranges between 2-7 years old and unlike other models this vehicle a spacious design and very extensive wagon to carry toys, spades, and buckets for a day of fun outdoors. This tractor has two speed settings perfect for younger and older kids or those feeling a little more confident. The lower setting is 2.5 mph and the higher speed is 4.5 mph. This power wheel tractor also comes fitted with a working FM radio, allowing you to change the radio station and sing along while driving. Just like real tractors, the seat is extremely roomy and comes equipped with an adjustable arm seat. This ride-on is powered by a battery, which is positioned under the steering wheel making it a little awkward to gain access to. In addition, the battery tends to run out faster when 2nd gear is used as opposed to 1st gear. A great bonus of this tractor is that there’s the option to buy a better battery that lasts longer, perfect for older kids that want a longer ride. The Sportrax 4WD ride-on toy is quite different from the other power wheel toys we have reviewed. The Polaris RZR can accommodate two kids at once, making it ideal for siblings to share or play together with friends. The Polaris offers a healthy power supply with a 12 volt battery that can last over 1.5 hours between each charge. In addition to the sporty frame, this ride-on toy comes fitted with a horn and an MP3 player port, allowing you to connect it to your kids favorite music. Moreover, the volume can be adjusted as required and can be easily changed from the comfort of the dashboard, perfect for kids who love riding to the sound of their best songs. Another comforting feature of the Polaris which offers parents peace of mind is the remote control feature. This enables parents to take over the ride at any time, making it ideal for learner drivers or kids who might need a little help from time to time. As you may expect from a sporty looking buggy like the Polaris, it does have a 4 wheel drive making it one of the best power wheels for off road driving and driving on terrains that may need a little more grip. It’s normal for parents to have concerns about the size, speed, and features of the best power wheels model in question. But the bottom line is your kid’s safety as they enjoy riding. The truth is that the best power wheels have been designed in such a way that they can house small children securely and comfortably. Safety features – It’s important to remember that there are many potential hazards to consider when looking for the best ride on vehicle for your child and the likes of tipping over and crashes are two good examples. Much of this is simple common sense and bearing in mind where you will likely be using the powered vehicle will help in making such decisions. Always ensure that the route of their journey is clear of any potential hazards such as chairs and ornaments. However, be assured that the majority of the best power wheels for younger children are very slow and fitted with safety mechanisms that ensure they stop if an obstacle is hit. The charging of the vehicle is also something to consider and of course, should always be carried out by a responsible adult only. It may also be a good idea to use protective gear for your kids, as although this doesn’t come included with the majority of ride on vehicles, it is certainly advisable, especially if outside riding is your aim. Battery Powered or leg-powered – What sets these apart is that battery powered models require recharging at regular intervals, however, they offer more stability and thus are less likely to tip over. The reason for this is simply because when kids use their own legs it’s incredibly easy to tip over the vehicle and their own bodies with it. The battery power provides steering power and therefore requires little concentration, freeing up time for your child to enjoy the ride. A leg powered model obviously has its place too but is best suited for more mature kids who have more confidence in their abilities. Suitable for 2-year-olds? – If you are unsure whether the model is designed for a specific age group ensure you check the manufacturer’s instructions. This will ensure that the vehicle is suitable for a specific aged child with safety and design in mind.